Shopping for spreadsheets? If you’re in the neighborhood, poke through the inventory at the Organization for Economic Co-ordination and Development, acronymized OECD, you’ll be happy to know. We’ve been here before, on July 25 to be exact; but I told you it’s a large inventory. a self-described Public Beta page that enables you to “Find core datasets in the data warehouse and make your own tables and charts in OECD Stat Extracts”, a triflingly ambiguous inducement, appearing as it does to conflate the term “datasets” and the “Database” informing the title atop the quoted passage, but again, that’s a trifle. More to the point is the availability of the data in either unmediated spreadsheet form, or downloadable as such via an Export button. A first view of the sheet exposes it in Page Break Preview, a perspective on the data that won’t particularly advantage the analyst, and so you’ll want to make your way back to the standard Normal View. Moreover, the recourse toward the Freeze Panes selection at the columnar intersection of A and B seems puzzlingly needless, as the sheet bares all its numbers and country names immediately. I’d unfreeze the panes right away, even as I continue to wonder about the dictionary form which Microsoft mines its verbs. What would your teacher say about unfreeze? In addition, the missing field header in column A needs to be supplied. Now this facile breakout of the asylum numbers by year is ready to happen, because all the years share the same Year field as an item. Try the above pivot table that when the each and every year occupies a field to itself. Same numbers, same juxtaposition of fields. So what was my point? That’s a sweat-inducingly good question. 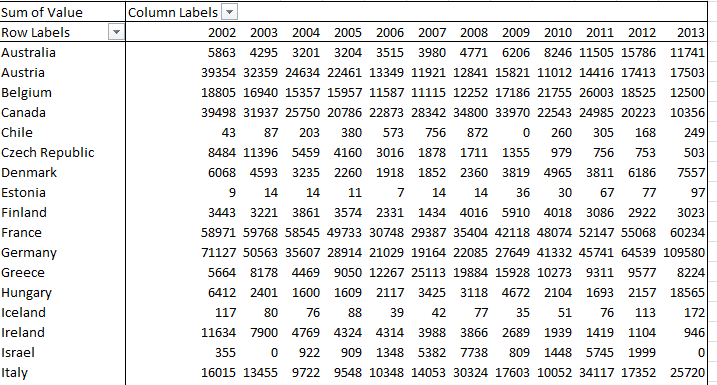 But once all those years and their concomitant data recuse themselves from fields into items you can also treat the values to the % of Row Total styling, and learn, for example, that 30.88% of Turkey’s asylum seekers during the 2002-13 interval made their way to that country in 2013 alone, a clear attestation of the Syrian conflict’s scattering effect upon its populace. Less obvious is Hungary’s 2013 percentage of 37.22 of all the seekers it received across the 12 years, a skew I can’t yet explain. 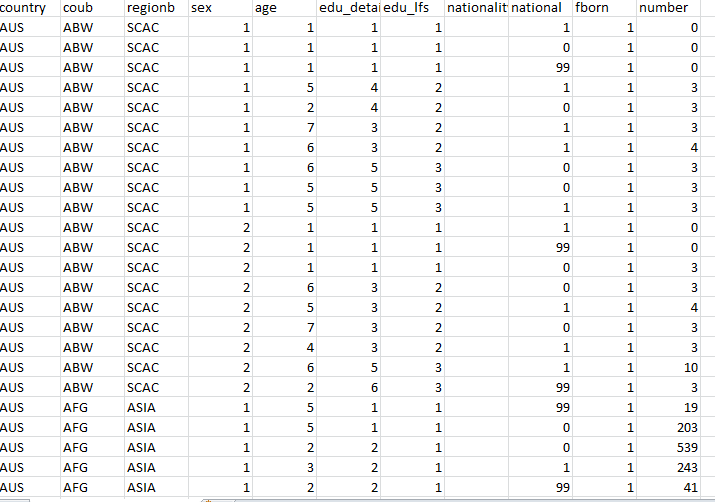 Compare that far larger dataset’s field structure with that of the one above, e.g. That’s really more like it, even if the data themselves could stand some clarification (I’d bang out a lookup table that would return country names in full, and the data are available on the OECD site in a PDF for doing so. Is AUS, after all, Austria or Australia?). And these variously-structured workbooks drag one ore question into the fray: why should some OEDC workbooks be stitched along this, or that, pattern of design – fields as items, or items as fields? I don’t know, that answer; nor do I know if the OEDC has endeavored to think about it. But I’ll be happy to think about it, folks. Here’ – I’ve attached my business card.